The Darrel Ralph DDR TAS Automatic has been around for a few years, and has gone through a few iterations. 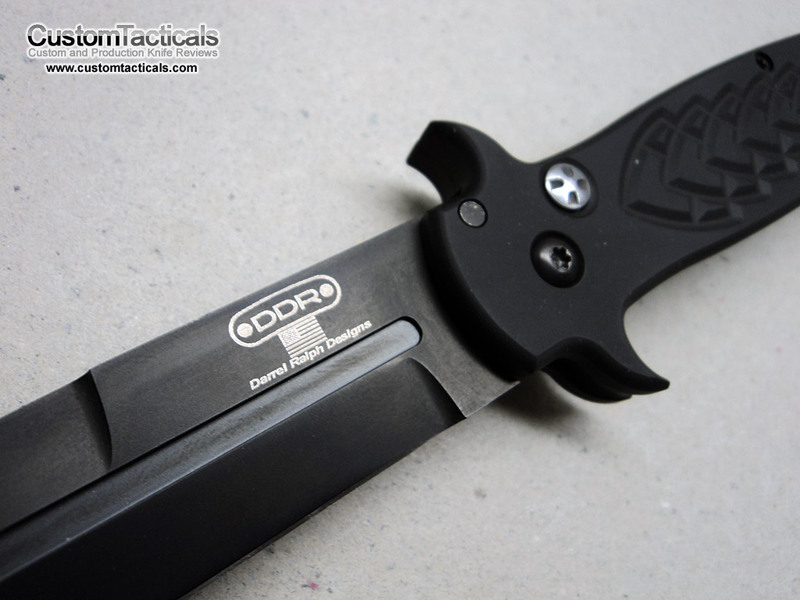 The knife was initially machined and produced by Wilson Combat, but Wilson Combat and Darrel Ralph parted ways and this appears to be a later edition of the TAS Automatic that does not come from Wilson Combat. Since the knife was received in a trade, I’m not really sure of the origins, but the knife comes with a darrelralph.com pouch, telling me that it may have come from Darrel’s shop directly as a production piece. While the history of the piece is not entirely known to me, I can definately comment on the build quality. The blade is a dagger-point single edged blade, with a SLIGHT sharpening of the back side of the blade near the very tip. 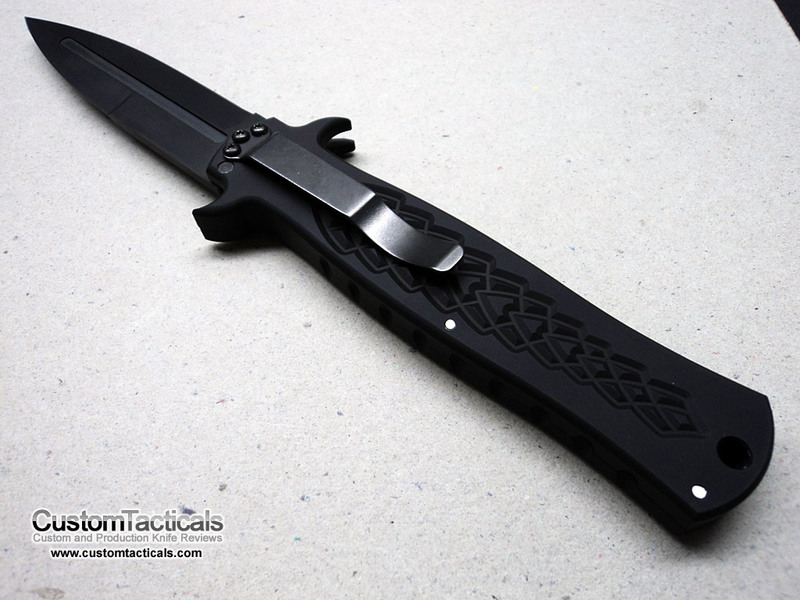 The blade steel is 154CM and very sharp, and features a black DLC coating on the blade. I really dig daggers, so this stiletto-style knife really does it for me as I find it functional as well as aesthetically pleasing. This is a Hard Annodized Type-III Aluminum handle, and reminds me a little of a Dalton. Devoid of any real intricate details, but still contoured well to fit the hand. It doesn’t have the “schwict” sound that Dalton’s have, but from looks alone, one could easily mistaken the knife for a Dalton. The finish is very good, and I don’t have much to complain about there, but the stop pin is loose in the handle, which makes the knife rattle when you have it closed. This is annoying to me. Perhaps this is an isolated incident? 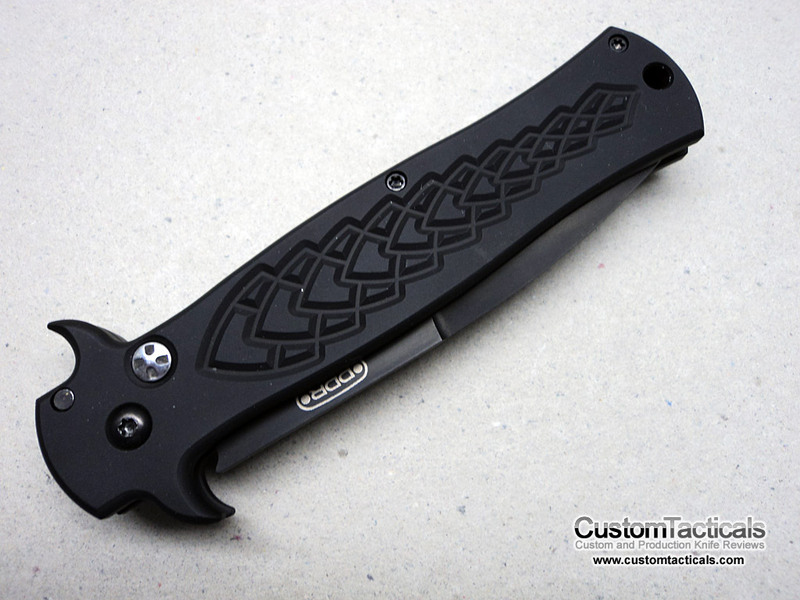 Overall the machining is excellent and very suited to a knife in this price range. Price online is approximately $229 right now. The knife fires hard and fast, and the lockup is very good. The finish on the piece gives it feeling of quality with no machining marks that you often see on cheaper pieces. There is no safety on this button lock automatic. A great piece if you like Automatics, and a nice Darrel Ralph design that has stood the test of time. I think this is a very versatile piece that would have a home in any knife collection. As for using it as an EDC, I find the stiletto style guards a bit awkward for storage and for tucking in the pocket as they can get in the way. I personally don’t like Autos for EDC, so that would be a deal breaker for me as well. Aside from that, it could work well for another person. The dagger shaped blade has a nice long flat edge for slicing, as well as some belly and a good tip for penetration. I had one of the other “iterations” of this knife. I can’t remember who made it. I think he made it with another knifemaker. Can you help with the name and manufacturer? Thanks. Possibly.. but I would need more information than what you’ve given me.